The Whites: "Refugee community is our mission"
» We all know the Golden Rule: love your neighbor as yourself. But Derek and Alicia White, active members of the Lifesource Adventist Fellowship, are taking this rule and making it their goal in life. Everything this couple does is entwined with serving their community. Derek attended law school and immediately upon graduation, began volunteering for the Colorado African Organization, where he is currently employed. Alicia got her undergraduate degree in international studies before completing nursing school. In the last few years, she has also gotten involved with Bridges to Care, a group that targets frequent emergency room visitors and helping them overcome behavioral health issues and other barriers by sending specialists and nurse practitioners to their homes. 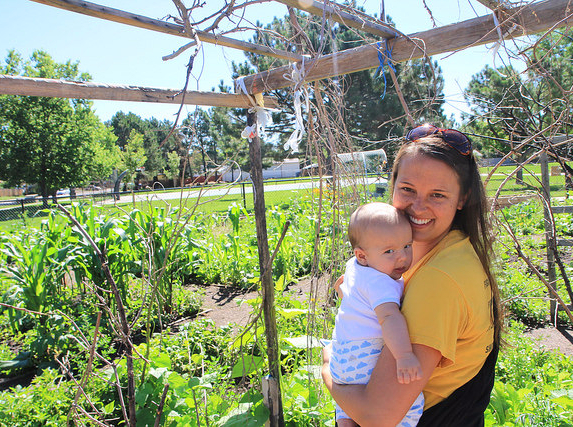 Three years ago, they were asked to take charge of the community garden in Aurora, Colorado. Derek, who works with providing green cards and other legal services to refugees, had already met quite a few Burmese families who lived in the area. Founded through Denver Urban Gardens, the garden boasts quite a full roster. There are 36 plots and 10 raised boxes, a new feature that allows for some families to move off of the waitlist and get involved. Currently at least 45 different families work in the garden. The garden has a chain link fence around its perimeter. Hanging about a foot apart are small wooden squares, each painted with different scenes, styles, and colors. As a way to include the children of the families who use the community garden, Alicia had them each paint their own square to be hung up. “It’s a way to make the kids feel more included,” she said. Unfortunately they were all stolen a few years ago. Slowly, they are being replaced by new pieces, but thieving and vandalism is still an issue. Much of the recognizable produce, like watermelons and pumpkins, will get stolen or vandalized. In addition, the sizable shed that sits in the corner of the garden repeatedly gets covered in graffiti. The Whites strongly believe that a community garden’s purpose is to garden as a community, working together. But unfortunately, sometimes it becomes prideful and individualistic, everyone worrying about their own plots instead of interacting with each other. They try to schedule a community workday once a month and host a potluck provide an opportunity to get together and garden at the same time.